This post continues the conversation started in the earlier post which disclosed the UK’s Top 10 Customer Experience brands and provided an analysis of the Top 100 brands by industry. The folks at Nunwood claim “we have used advanced text analytic techniques to derive and then statistically validate the six most important factors that customers talk about when it comes to great experiences”. What are these factors? What can we learn about these six pillars of Customer Experience by looking at the Top 10 brands? QVC leads in both the Resolution and Empathy pillars. In the next and last post, I will share with you details of the “brands that have cracked the code” and are making major leaps forward – according to Nunwood. And in particular I will single out one brand that shows up for as being truly innovative in its business model, in customer engagement, in being social and making online community work, in putting its customers truly at the centre of its way of doing business. I also happen to be a customer of this brand. to point out the blindingly obvious? I find myself in perfect agreement with you. And if you are a ‘consultancy’ selling your ‘secret sauce’ then you will make the simple into the complex. So I can see why it is that Nunwood point to their ‘secret sauce’ or why Beyond Philosophy make a big deal of their ‘secret sauce’ around customer experience. For me, it shows up as salesmanship. Put simply: one cannot sell and get rich on selling the blindingly obvious. 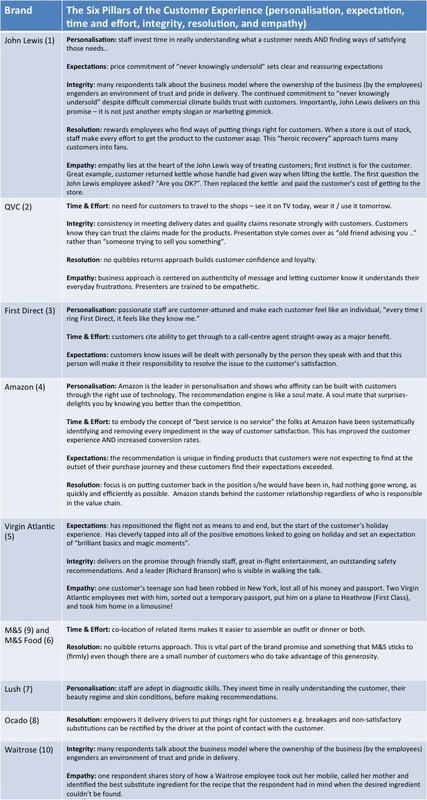 I would suggest that Nunwood’s report is useful insofar as it identifies favourites but your analysis of what the identified brands to to deliver exceptional service is much more insightful and useful. Thank you and well done.